But the main rip off is the caps type used. They are OST 680uF 4V caps, so not a good caps by any way In short, they show you seven polymers, but deliver there OST crap caps. Is not that irony? Mine MSI PM8M3-V is PCB v. 1.0. Only there Ost caps on side, FOUR missing! That is stealing by MSI marketing! Near NIC (Realtek RTL8100C) is G-Luxons (!) ... a terrible known bad caps. Unacceptable! However certain things go wrong. The first was, that I managed thru friend to order only the original number of the 1000uF 6.3V caps, 12 of them. I had to improvise and replace the remaining 4 unused before with the Samxon GC caps, witch is similar is quality, tested good caps. At lest I see what caps are new there, lol. And at last I completely forget the little SMD cap behind the AGP slot, witch I indented to replace with ceramic caps, when there is available even 47uF ceramic SMD caps with the little 12210 size! And the NIC controller must be jumping out of joy, because it got the quality Nichicon LE polymers voltage filtering instead of the G-Luxon crap caps - now this is a jump in quality! And at last - overal look on the Vcore regulation - now it look far much better that before! And the result? Well, the CPU and rams and HDD is working perfectly. The Vcore regulators, with the serious heatsinks, are - even that no fan is blowing at them, yet I removed the serial and parallel ports to get them better ventilated - after a day of work, night of stress test and half day of gaming heardly even warm...! That well shown the fact, that quality caps means lesser temperatures of the components. That was just great. And with stock box fan and no case fan...! 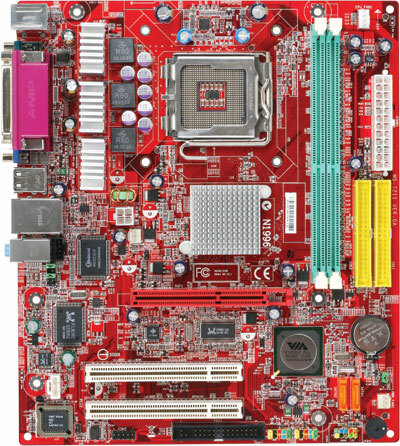 So, in the long run, I was just wanted to prove, that I can do it and I can do it better that MSI Also my point was, how much can these review board differ from what one can actually buy (compare first two images). If one look closely, you see that on the "advert" board is 10 pcs of ceramics inside of the LGA 775 socket. And on the sale version, there are just 4 pcs of the ceramics. Seems that these damn people remove everything that they can. Maybe that is why they disabled a LOT of options in the bios, so user cannot seem them, much less tweak them. Maybe overclocking won't work stable, because of all these removed caps...? Current time: 04-23-2019, 03:51 PM Powered By MyBB, © 2002-2019 MyBB Group.